As a consequence of the reaping of the angel, who is told to reap the earth (Rev 14:18-19), and the life threatening implications of the bowl plagues, no human beings survived Armageddon (Rev 16:1-21; 19:11-21). All who remain on earth are angels who, because of their fallen state, are confined to earth (Rev 12:7-9). 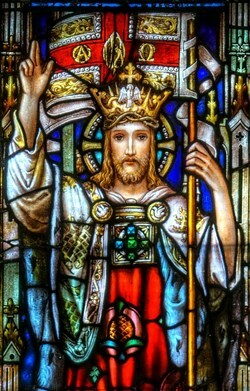 Reigning with Jesus Christ during the Millennial Kingdom are the tribulation saints "who had been beheaded because of their testimony of Jesus and because of the word of God, and those who had not worshiped the beast or his image, and had not received the mark on their forehead and on their hand" (Rev 20:4). These saints comprise first resurrection of Believers which occurs at the start of the Millennial Kingdom (Rev 20:4), and they are "blessed and holy" and "over these the second death has no power" (Rev 20:6). Special because of their stalwart perseverance during this unique period of harsh persecution of their faith, these Believers were honored with authority to reign as priests of God and of Christ with Jesus during the Divine Millennial Kingdom (Rev 20:4). An example of these martyred Believers are those seen under the alter (Rev 6:9-11). Satan’s imprisonment and removal of his evil influence from his fallen angelic followers may serve a redemptive purpose. Through the atonement of Jesus Christ, all things in heaven and earth were reconciled with God (Col 1:19-20), which seems to include fallen angels. But the writer of Hebrews indicates that Jesus' atonement does not help angels (Heb 2:16-17). After the millennium, the apostle John reveals that Satan will be released from the Abyss to deceive again (Rev 20:7-8). In the final war with Satan, no human military tactic is used; instead, heavenly fire consumes the enemy (Rev 20:7-9). Brimstone, which also originates from heaven (Gen 19:24; Ezek 38:22), supplies the lake of fire and is the means to eliminate Satan forever (Rev 20:10).